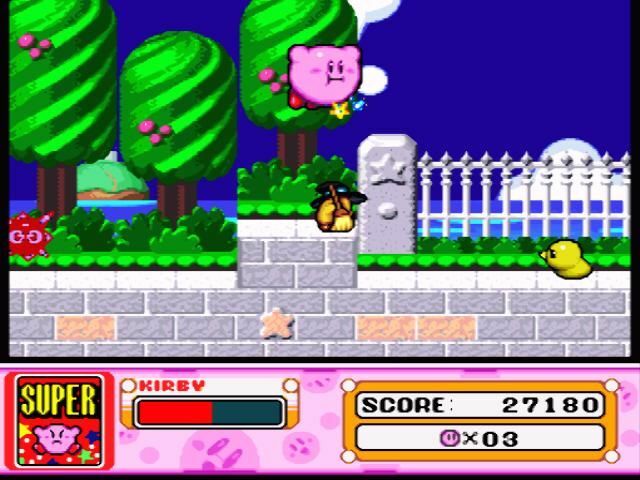 Kirby Super Star is a six game compilation that was released in Europe as Kirby's Fun Pak. 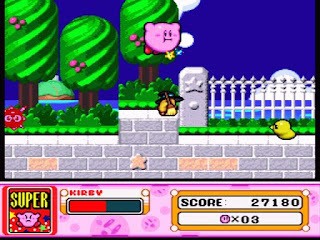 Spring Breeze is a partial remake of Kirby's Dream Land (1992, Game Boy). It only contains four cut-down levels and is very easy, but it's an enjoyable platforming romp. The addition of being able to use the copy ability and a co-op friend (both not found in the original) makes for some blissfully entertaining gameplay. Gourmet Race is a three round GP vs King Dedede and the objective is to collect the most treats, while placing first to earn extra points. It's a decent diversion, but it's short and needed more CPU opponents. Dyna Blade is an exclusive five level platformer that has an awesome boss rush section at the end of Level 4 and includes many secrets and optional routes to keep you coming back. A short, but charming game that's worth the price of admission. The Great Cave Offensive sees you searching a cave for 60 treasures and features a huge, interesting world to explore. It's seriously addictive hunting around and solving the game's puzzles, and I love that the game allows you to continue your quest for missing treasure even after the credits roll; easily the standout title. In Revenge of Meta-Knight you need to destroy Meta Knight's ship against the clock. It's a much grittier variation that's seriously intense due to the ever-depleting timer and the story arch that plays out while you battle. The fast-paced nature really works and it's full of surprises; a real gem. Milky Way Wishes is a platformer / adventure game; the level design isn't tight and can be confusing due to the sheer amount of paths you can take. Does feature a cool side-scrolling shooter area but overall a half-hearted addition. Kirby Super Star contains hours upon hours of extremely entertaining content and the sheer quality and variation on offer throughout the collection is astounding. The Great Cave Offensive could easily have been a top-tier SNES retail game by itself, so consider the rest to be the cherry on top of a very delicious cake! Random trivia: Two unexciting and throwaway sub-games called Megaton Punch and Samurai Kirby (both 1-vs-1 battles with timed button presses) are also available.